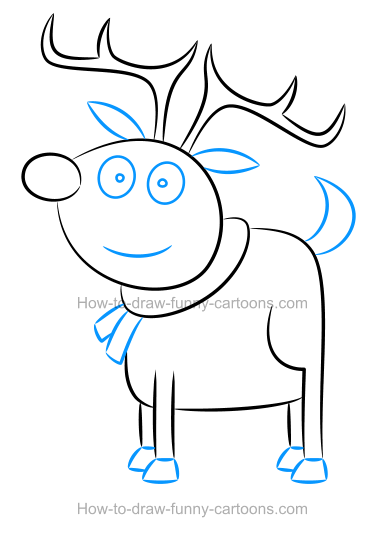 In this fun lesson, you will learn to draw a reindeer clipart using adorable shapes, lines and colors. This cute character is also filled with simple basic effects and shadows to give more depth to the final image. Of course, it is highly recommended using a vector application to draw this cute cartoon animal. Most digital effects are much easier to apply when using a software (unlike drawing by hands, which requires more time and more drawing abilities). 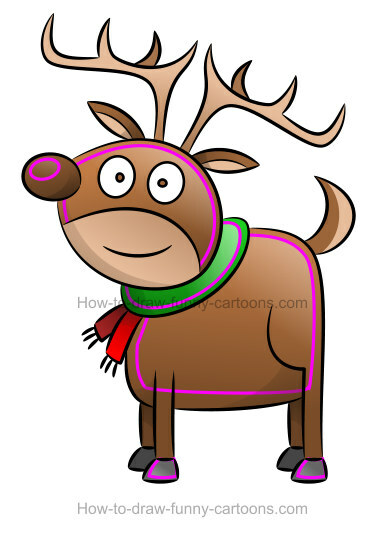 First, you can use a few simple curved lines to form the antlers, the head, the nose, the scarf, the body and the legs. All these lines are thin and pointed on both ends. Also, notice the posture of the character as well as the small tilt of the head compared to the rest of the body. When you are done, you can proceed with the second step. 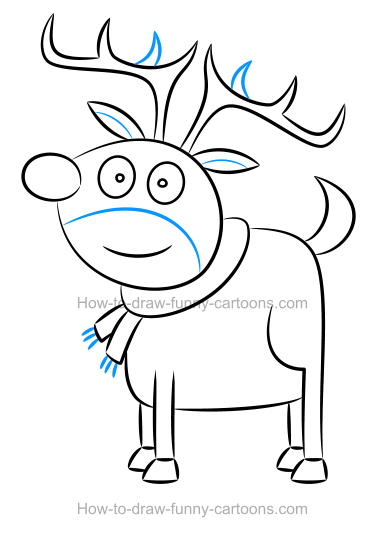 It's time to draw more details to create a great personality to this cute reindeer clipart. You can start by sketching two large eyes using oval shapes. Pupils are made from simple dots. On top of the head, ears are drawn using curved lines. You can also draw the mouth, the tail and the hooves using more thin lines. Don't forget to sketch two small rectangles near the scarf to complete this one. 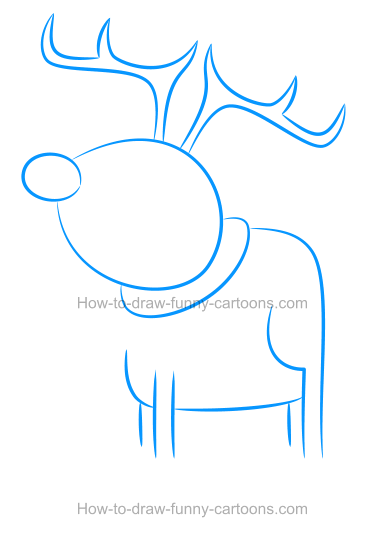 On top of both antlers, draw another small pointed shape made from short lines. Inside the ears and the mouth, draw small curved lines to separate colors. Finally, complete this third step by sketching very short pointed lines on the scarf (as shown below). step 4 - colors to bring this character to life! It's time to add plain colors inside the character and create something visually more exciting! The body, the head, the legs, the nose, the ears and the tail are filled with a bright brown color. The antlers as well as the brighter shapes found inside the ears, the head and the tail are also filled with a brighter version of the same color. The scarf is green and red while the hooves are grey. Adding a second color to a shape is a good idea to create more volume quickly and easily. Using color gradients, simply make all shapes from the character darker on the bottom and brighter on top. Only the area found around the mouth is darker on top (instead of being darker on the bottom like all other shapes). Our goal is to create a simple and appealing reindeer clipart. That's why we don't need to sketch hundreds of cool shadows to achieve our goal. Just a few strategic shapes (that are partially transparent for a better result) are needed. As you can see below, these shadows were added on the bottom of the ears, below the nose, near the mouth, on the scarf, below the body of the character and on top of both back legs. Another simple technique to create more volume is to sketch brighter shapes (highlights or reflections) inside the character to create more contrast. These shapes are usually white and partially transparent. You can see below that these shapes were added inside the nose, the head, the body, the scarf and the hooves. 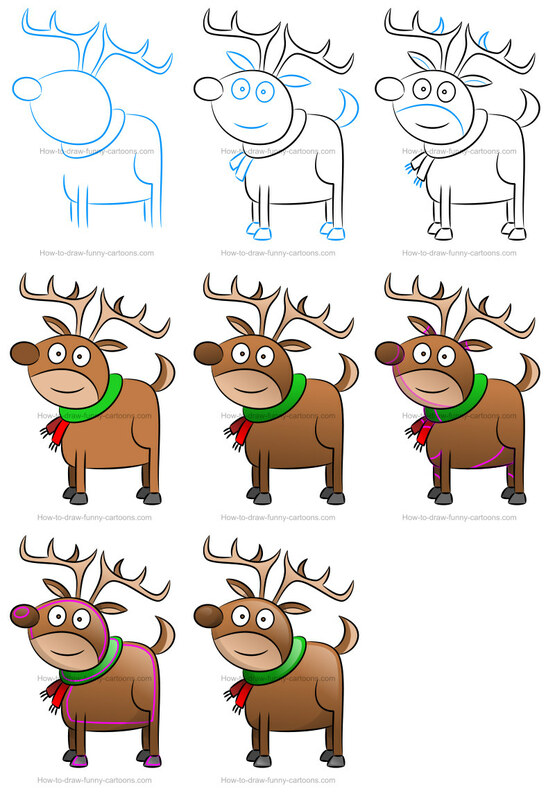 drawing a fun reindeer clipart has never been so easy!